CBI - China: Day 58 of 154 of the Japanese Invasion of Manchuria. Spain: Day 121 of 985 of the Spanish Civil War. CBI - China: Day 26 of 29 of the 1st Battle of Suiyuan. Spain: Day 486 of 985 of the Spanish Civil War. CBI - China: Day 131 of 2,987 of the 2nd Sino-Japanese War. Day 94 of 106 of the 2nd Battle of Shanghai. Spain: Day 851 of 985 of the Spanish Civil War. CBI - China: Day 496 of 2,987 of the 2nd Sino-Japanese War. Day 34 of 81 of Japan's Operation GUANGDONG. CBI - China: Day 861 of 2,987 of the 2nd Sino-Japanese War. ETO - UK: Day 70 of 258 of the Blitz. Coventry is hit in a raid that kills or injures 1,419 people and makes thousands homeless. East Africa: Day 158 of 537 of Italy's East African campaign in the lands south of Egypt. CBI - China: Day 1,227 of 2,987 of the 2nd Sino-Japanese War. Day 366 of 381 of the Battle of South Guangxi. CBI - Thailand: Day 45 of 221 of the Franco-Thai War (Vichy France vs Thailand). Russian Front - Finland: Day 139 of 142 of Operation SILVER FOX, a joint German-Finnish campaign to capture the Russian port of Murmansk in the Arctic. Russian Front - Finland: Day 137 of 140 of Operation ARCTIC FOX, a joint German-Finnish campaign against Soviet Northern Front defenses at Salla, Finland. Russian Front - Finland: Day 146 of 164 of the Battle of Hanko. The Soviets will be forced off their leased naval base. Russian Front: Day 146 of 167 of Germany's Operation BARBAROSSA. Russian Front - North: Day 68 of 872 of the Siege of Leningrad. Russian Front - Center: Day 44 of 98 of the Battle of Moscow. Russian Front - South: Day 16 of 248 of the Siege of Sevastopol, Crimean Peninsula. MTO - Libya: Day 219 of 256 of the Siege of Tobruk. East Africa: Day 523 of 537 of Italy's East African campaign in the lands south of Egypt. CBI - China: Day 1,592 of 2,987 of the 2nd Sino-Japanese War. PTO - Solomon Islands: In Day 3 of 4 of the Naval Battle off Guadalcanal, US and Japanese warships clash again, resulting in the sinking of the cruiser USS JUNEAU and the deaths of the five Sullivan brothers, who had been granted their request to serve together on the same ship. 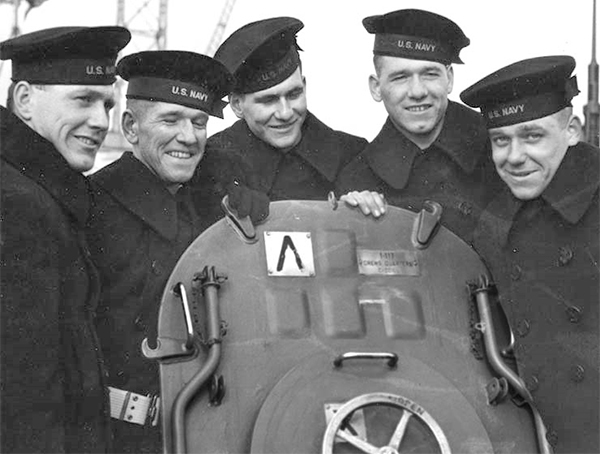 The Sullivans, natives of Waterloo, Iowa, enlisted in the US Navy on 03 Jan 42 with the stipulation that they serve together. The Navy had a policy of separating siblings, but this was not strictly enforced. As a direct result of the Sullivans' deaths, the US War Department adopted the Sole Survivor Policy, designed to protect members of a family from the draft or from combat duty if they have already lost family members in military service. ETO - France: US 8th Air Force heavy bombers hit the port area at St Nazaire. Russian Front - North: Day 433 of 872 of the Siege of Leningrad. Russian Front - North: Day 194 of 658 of the Siege of the Kholm Pocket, USSR lays siege to the Kholm Pocket but the Germans hold out for a about a year and a half. Russian Front - South: Day 140 of 150 of Germany's CASE BLUE, the failed offensive to take the Caucasus oil fields. Russian Front - South: Day 84 of 165 of the Battle of Stalingrad, bloodiest battle in human history. MTO - North Africa: Day 7 of 9 of Operation TORCH, the invasion of Morocco and Algeria. The US 12th Air Force provides air support. MTO - Libya: US 9th Air Force heavy bombers attack the harbor at Bengasi. CBI - China: Day 1,957 of 2,987 of the 2nd Sino-Japanese War. PTO - Alaska: Day 161 of 435 of the Battle of Kiska, Aleutian Islands. The US and Canada will defeat the Japanese invaders. PTO - Malaya: Day 269 of 357 of the Battle of Timor Island, a long guerrilla war ending in Japanese victory. PTO - New Guinea: Day 117 of 119 of the Battle of the Kokoda Track. The Australians continue pushing back the Japanese troops. PTO - Solomon Islands: Day 3 of 4 of the Naval Battle off Guadalcanal. Russian Front - North: Day 798 of 872 of the Siege of Leningrad. Russian Front - North: Day 559 of 658 of the Siege of the Kholm Pocket. USSR lays siege to the Kholm Pocket but the Germans hold out for a about a year and a half. Russian Front - South: Day 83 of 122 of the Battle of the Lower Dnieper River, USSR. The Soviets launch three offenses at Apostolovo, Nikopol, and along the Krivoi Rog River in Ukraine. MTO - Bulgaria: US 12th Air Force B-25s bomb targets at Sofia. CBI - China: Day 2,322 of 2,987 of the 2nd Sino-Japanese War. Day 13 of 49 of the Battle of West Changde. PTO - New Guinea: Day 57 of 219 of the Battle of Shaggy Ridge. PTO - New Guinea: Day 54 of 162 of the Battle of the Huon Peninsula. PTO - Solomon Islands: Day 14 of 295 of the Battle of the Bougainville Islands. ETO - Netherlands: The British begin their attack on Maas in central Netherlands. ETO - France: Day 106 of 284 of the Battle of Brittany. ETO - France: Day 61 of 236 of the Siege of Dunkirk. ETO - France: The French 1st Army launches an attack on Belfort while the US 95th Infantry Division begins capturing the Metz forts. ETO - Germany: Day 57 of 145 of the Battle of Hürtgen Forest. Russian Front - Finland: Day 61 of 223 of the Lapland War. Finland and Russia have joined forces to kick the Germans out of Finland's most northern province. Russian Front - Center: Day 31 of 206 of the Battle of the Courland Pocket in Latvia. Russian Front - Center: Day 24 of 99 of the Siege of Memel, a border town of Lithuania and East Prussia. Russian Front - Center: Day 62 of 72 of the Battle into East Prussia and northern Poland. Russian Front - South: Day 17 of 108 of the Battle of Budapest, Hungary. Russian Front - South: Day 62 of 72 of the Battle of Belgrade, Yugoslavia. MTO - Italy: US 12th Air Force: Bad weather restricts operations, allowing just P-47 attacks on rail lines and road north of the battleline. CBI - Burma: Day 228 of 302 of the Chinese Salween Offensive in Burma. CBI - Burma: Day 1 of 31 of the Battle of Bhamo. CBI - China: Day 2,688 of 2,987 of the 2nd Sino-Japanese War. Day 212 of 259 of Japan's Operation ICHI-GO. PTO - New Guinea: Day 323 of 597 of the Battle of New Britain. PTO - New Guinea: Day 207 of 481 of the Battle of Western New Guinea. PTO - Palau Islands: Day 61 of 74 of the Battle of Peleliu (Operation STALEMATE II). PTO - Philippines: Day 26 of 299 of the 2nd Battle of the Philippines, aka the Liberation of the Philippines or the Philippines Campaign. PTO - Philippines: Day 26 of 73 of the Battle of Leyte. PTO - Philippines: Day 4 of 41 of the Naval Battle of Ormoc Bay.